No one ever thinks that it could happen to them…until it does…and then they understand just how quickly the “American Dream” can turn into the “American nightmare.” In what has to be one of the most depressing documentaries ever, Hard Times: Lost on Long Island shows beyond a shadow of a doubt that bad things happen to good, hard-working people. There used to be a perception that people who needed any kind of government assistance were lazy, unmotivated and perfectly content to “live off the dole.” In some circles, that perception still exists, and while it may be true for some, it certainly is not true of those who were once considered middle class and upper middle class not too long ago. Anyone who thinks otherwise should take an hour out of their day to watch this eye-opening HBO Documentary. Seeing the shear agony on the faces of those who were brave enough to share their story with the world should be enough to at least alter the perception of those who think that government assistance is a crutch that merely prevents people from trying to find steady employment. It simply is not the case. Growing up on Long Island, I didn’t see much poverty, although I’m sure that it always existed in places that I never frequented. My only real exposure to poverty as a kid was in Manhattan when my father used to take my brother and me to the Bowery to see the “bums.” Back then, they weren’t called homeless. And though many years have passed since I last visited the Bowery, I do remember that the “bums” did not seem particularly desperate, rather more resigned to living on the street and drinking heavily. That’s not to say that some of them weren’t in real pain, but they just didn’t seem as hopeless and sad as people are today (even those who still have a home). In May of 1947, the suburban dream began on Long Island in Levittown with 2000 affordable homes being rented and then converted into purchases with no down payment and monthly mortgage payments equal to the rental price. The concept then spread across America. The first apartment that my wife and I shared together was a rental in Levittown. When the homeowner died and the house was sold, we were asked to leave the property. The job market at the time for elementary education teachers on Long Island was very difficult, so my wife gave up on the dream of becoming a teacher and we moved to Manhattan. After moving around a bit, we ended up back in the suburbs of Suffolk County, where we saw first-hand that life on Long Island quickly got to be very expensive. Being a real estate agent at the time, I foolishly believed that the irrational exuberance of the real estate market would continue and home prices on Long Island would keep rising, so we purchased a home at the height of the market. All bubbles burst, so it is not at all surprising to me (in retrospect) that the real estate bubble burst as well. And as a result, the suburbs are now the fastest growing area of poverty in America. Those who think that foreclosure and bankruptcy could never happen to them should not think in such absolute terms. 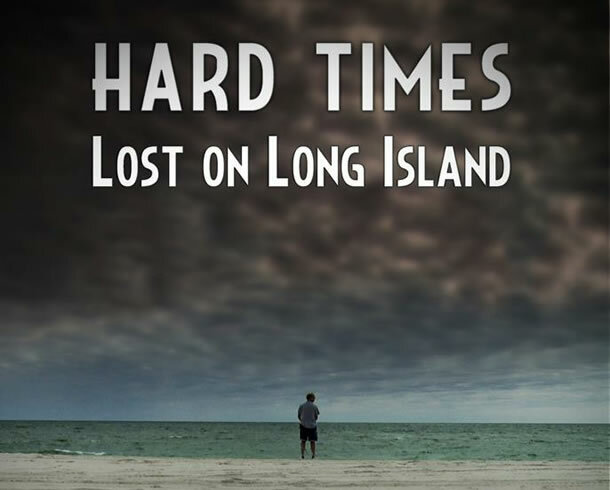 The stories featured on Hard Times: Lost on Long Island were about successful people with good jobs who lived within their means. But when income is lost for whatever reason, it is impossible to continue to live the same lifestyle, even for the most disciplined among us. Unlike most fictional stories that come out of Hollywood, this documentary did not feature many happy endings. Only one of the people featured in the program was finally offered a job (after a two-year search). The others continue to struggle and one story ended in tragedy. Dave Hartstein, a 35-year-old chiropractor and father of three (including an infant with Downs Syndrome), died after contracting Hantavirus while cleaning out the basement of his home to put it up for sale. He and his wife, Heather (an out-of-work school teacher), had filed for bankruptcy and were trying to work out a loan modification with the bank at the time. Please share your experiences (anonymously if you would like) in the comment section below. If you, or someone you know, has been out of work for a long time or forced to rely on any kind of government assistance during this economic crisis, please share this post on Facebook (or privately). At the very least, those who are suffering will know that they are not the only ones who are going through difficult times.